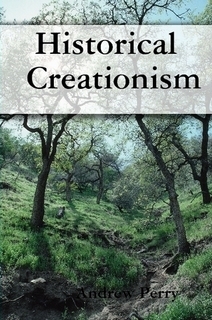 "This book (125 pages, ISBN 978-0-9574460-4-5) advocates Historical Creationism — a view that holds Genesis 1 to be an historical account of a creation ‘week’. It presents a straightforward view of three aspects of Genesis — the firmament and the waters above the firmament are not mythical elements but historical aspects of God-manifestation in the account, and the concept of the earth is not that of a ‘flat earth’ (or a 'planet' for that matter) but just one of ‘dry land’ or ‘all land’ or 'all things below'. The book offers an interpretation of Days One, Two and Four centred around the Christadelphian doctrine of God-manifestation."